Scanning or copying books will get a lot more comfortable in the future, thanks to the Ishikawa-Komuro lab at the University of Tokyo. The lab has already developed an awesome prototype of a camera that shoots “3D” pictures of pages while a human quickly flips through a book (see video below). Now Japanese business daily The Nikkei is reporting that the university and major printing company Dai Nippon are planning to develop a high-speed copier that can take 500 pictures per second. The aim is obviously to make digitizing books and any other printed material much easier. That high-speed scanning system mentioned above (and shown on video below) is able to capture about 170 pages in 60 seconds. 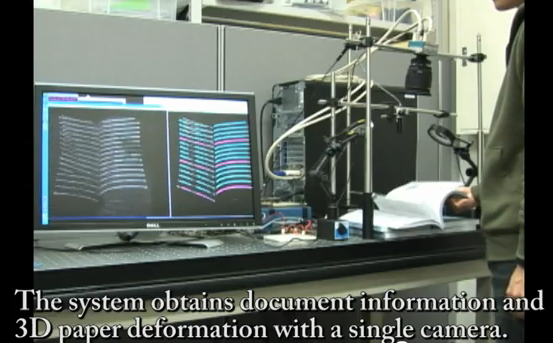 The new system is expected to be ready by 2012, with Dai Nippon saying it plans to develop “robots” to turn the pages.